Orange meet their doom in the first round for the first time since 2006. 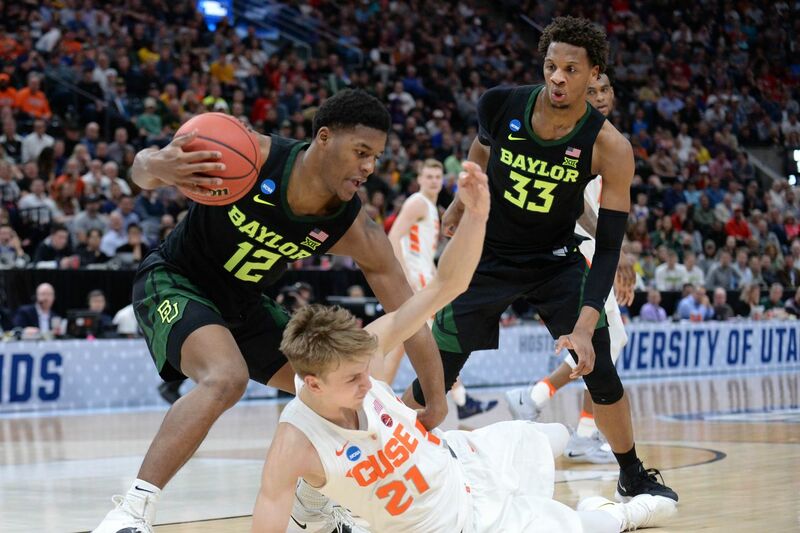 Baylor went 16-for-34 from three and deflected a late comeback attempt by Elijah Hughes to end a disappointing season for Syracuse. The Syracuse Orange men’s basketball team heads home from March Madness after one game for the first time since 2006. Baylor hit 16-of-34 attempts from three, a game-long trend that doomed Syracuse’s defense and forced a combined 6-for-21 game from Tyus Battle and Buddy Boeheim in the absence of Frank Howard. Baylor won 78-69. In the guise of Virginia, the Bears unloaded three after three and splashed them all. Mario Kegler twice. Makai Mason. Jared Butler. Baylor hit four straight threes to lead 12-4 in under four minutes over the Syracuse zone. Their 10-for-18 three-point shooting in the first half could’ve spelled the Orange’s demise, but on the other side Oshae Brissett, Elijah Hughes and the freshly-returned Tyus Battle built a three-man offense that met their firepower. Hughes and Brissett both laid in early makes around the rim, then Hughes hit Syracuse’s first three five minutes in to keep the game at single digits. Mason made another three, playing through injury for Baylor, then Hughes and Brissett hit a 1-3-1 zone that the Bears tried early with two more threes. Battle drilled one off Buddy Boeheim for his first shot and SU trailed only 18-16 despite its defensive struggles. Hughes hit his third, trading threes with Devonte Bandoo, to usher in the entrance of Marek Dolezaj. He gave Syracuse a boost on both ends of the floor, finding Brissett for a dunk from the top of the arc and forcing a Butler turnover on a lob attempt inside. Battle fed Brissett for a three-pointer in transition then hit his own, giving Syracuse its first lead at 27-25. The Orange’s zone held firm for several minutes, then Butler hit a three in Battle’s zone before Battle charged to draw himself into foul trouble. Jalen Carey entered the game, spelling a turnaround for the Bears where Masson hit consecutive threes. Battle entered in the closing minute, yet the 10 defensive breakdowns on the perimeter cost the Orange the half 38-37. Battle exited halftime storming to keep up with consecutive threes from King McClure. Baylor scored on three straight possessions four minutes into the half to maintain their lead at 48-46. Dolezaj entered, again with a boost, to hit a pair of free throws, a three on the left wing and force a turnover on Mason. A play later Boeheim turned a missed three into an easy dunk for Battle in transition, shooting the Orange ahead 53-50. The Bears swung back with a 12-4 run capped by Paschal Chukwu throwing a secured turnover out of bounds. Bandoo and Butler hit two more threes to push Baylor toward Virginia territory, and Butler opened the interior with a layup and feed to Freddie Gillespie for a slam. Butler hit another three to push Baylor’s lead to seven and put a win in doubt for Syracuse. Hughes went to the bench injured, then reemerged to try and save the game. Within seconds of returning he blocked King McClure at the three-point line and hit two free throws. Within minutes he hit a second-chance three following Brissett’s offensive rebound and three more free throws after getting fouled outside. Syracuse got within three. Baylor responded, heading to the rim and getting consecutive jumpers inside the arc from Gillespie and Mason — prompting the press. It wasn’t enough, with Mason cleaning up the free throws, Gillespie running away for a dunk and sending the Orange home with Howard at the end of a disappointing season.